Corydalis is a plant for the discerning shade gardener. Lacy, elegant foliage and bright blossoms make this a perennial to go out of your way to find. Closely related to bleeding hearts, corydalis has similar feathery foliage and grows best in a partially shaded location with rich, moist soil. The plants form a low mound up to two feet tall and have unique one- to two-inch tubular flowers that are available in an array of colors, from sky blue to bright yellow to deep magenta. Corydalis is a very cold-hardy perennial that remains evergreen where winters are mild, but dies to the roots in cold climates. It does best where summers are cool, but tends to look a bit shabby in late summer in hot, dry areas. Thus, full shade and regular irrigation are best in the hottest climates. In the coolest climates it grows happily in a sunnier location and will thrive with little care. Corydalis is mainly used in shady borders mixed with plants like hostas, hydrangeas, and ligularia. It flowers heaviest in late spring, though it may continue to bloom sporadically throughout the summer. Still, it's best to combine it with plants that are in their prime in the heat of summer. 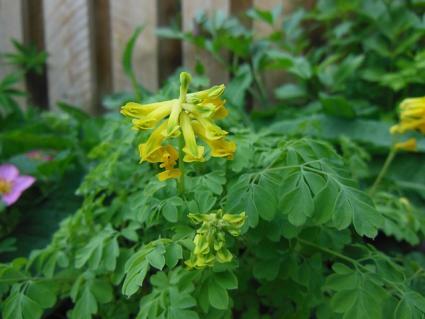 Corydalis is difficult to grow from seed packets, so most gardeners will purchase transplants from a nursery. It should go in the ground in fall or early spring in a bed of loose soil enriched with compost. Good drainage is essential. 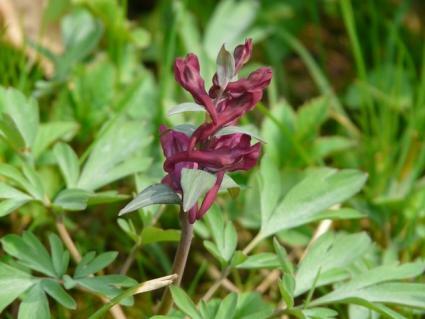 Weekly irrigation and removing spent flower stalks are the main tasks with corydalis. In midsummer, the plants can be cut back to stimulate a second flush of flowers. In climates where it grows as an evergreen perennial, it's a good idea to cut it back about 50 percent in late fall to encourage full, compact growth the following season. Maintaining a layer of mulch is a great idea to keep the roots cool, conserve moisture, and discourage weeds. 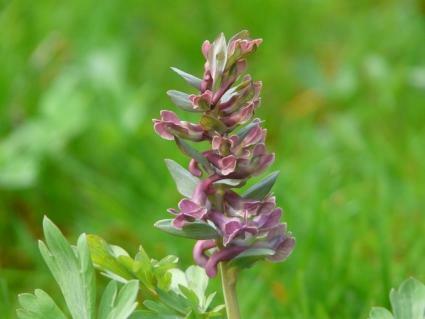 Corydalis is a short-lived perennial, but will spread itself by seed in its ideal environment (the fresh seed sprouts readily, though the dry seed does not). It does not become invasive, however, as the seedlings can easily be pulled where they are not wanted. Slugs and snails are the biggest issue with corydalis, making beer traps, diatomaceous earth or products like Sluggo an important part of the gardener's pest control arsenal in the moist climates where these critters are rampant. Various fungal and bacterial diseases may show themselves on corydalis, but these are really only an issue on plants that are stressed - at the end of summer in hot climates, for example. Often the best solution is to simply cut the plant back, water, add compost, and let the plant regrow when conditions are more favorable. Corydalis cultivars vary in both flower and leaf color. Blackberry Wine has fragrant purple flowers. Blue Heron has pale blue flowers with attractive reddish stems. Berry Exciting has golden yellow leaves with magenta flowers. Canary Feather has bright yellow blossoms with blue green leaves. Purple Leaf has blue flowers and purplish foliage. Corydalis is a bit finicky, but in the right spot it will thrive and may even spread itself. The color combinations of its fine foliage and unusual blossoms make it one of the most outstanding, though perhaps under-appreciated, shade specimens.